Understanding atmospheric particles and their effects on clouds is important for understanding the warming and cooling influences on the climate. Researchers at PNNL found a way to embed a high-resolution cloud model within each grid cell of a global climate model for a new way to account for the effects of small pollution particles. This research is part of a body of work demonstrating that PNNL is helping reduce some of the uncertainties with future climate change. Enlarge Image. Ground-breaking research from Pacific Northwest National Laboratory provided science insight for the Intergovernmental Panel on Climate Change (IPCC) Fifth Assessment Report's new lower bound estimate of the climate's sensitivity to increasing carbon dioxide concentrations. With contributions from thousands of science experts around the world, the report—the first of three working group contributions to the Fifth Assessment—prominently cited PNNL's work in several of its key conclusions on the causes and physical consequences of climate change. PNNL science contributions to the report are evidenced by citations of 17 PNNL lead-authored papers and more than 50 papers cited with PNNL authors. PNNL's body of work demonstrates a commitment to reducing some of the key scientific uncertainties associated with future climate change, as well as the value of U.S. investments in national laboratories that can address some of the nation's most challenging issues. And, as with past IPCC assessments, a number of PNNL scientists played important roles in producing the report. The new Fifth Assessment Report, dubbed the AR5, reduced its previous (2007) lower bound estimate of the climate's sensitivity to carbon dioxide (CO2) by 25 percent. PNNL science advancements provided an important foundation for this conclusion, which was based on notable reductions in the estimated influence of aerosols and aerosol-cloud interactions on the overall energy balance of the planet. "This report offers hope that dangerous climate change can be averted if carbon dioxide emissions are reduced soon enough," said Dr. Steve Ghan, Laboratory Fellow and author of several publications cited in the report. "The research provides evidence that atmospheric aerosols and their effects on clouds are not compensating as much of the radiative warming by greenhouse gases as previously was thought. This suggests the climate might not be quite as sensitive to carbon dioxide as previously estimated." Aerosols, tiny bits of suspended gases, dust or soot in the atmosphere, can directly affect the warming or cooling of the Earth by absorbing or reflecting sunlight energy. PNNL scientists unlocked several issues in understanding aerosol effects through a number of ground-breaking research efforts, a few of which are noted here. In Shrivastava et al., 2011, the PNNL-led team developed an efficient way to represent organic aerosols revealing previous underestimates of these volatile particles. They developed a way to "tag" each source of aerosols, such as fossil-fuel burning from vehicles and power plants, or biomass burning, and follow its path through a climate model. Their results can point to sources of climate change caused by either natural or human-caused activities. In Ghan et al., 2012, cited eight times, PNNL scientists demonstrated a simpler representation of both direct and indirect aerosol effects in a climate model, providing accurate and computationally efficient multi-century simulations. Given the variety of aerosol sizes and compositions, PNNL researchers shattered a current computational roadblock in representing the full complexity of aerosols' interactions in global simulations. In Liu et al., 2012, the PNNL-led team developed an innovative aerosol module for a climate model that balances realistic treatment of aerosols with a need for computational efficiency. The Modal Aerosol Module simulates the aerosol size distribution and has a more realistic representation of mixing states between aerosol components, both critical features to capture direct and indirect aerosol effects in a climate model. PNNL collaborated with an international team of scientists to understand how soot, a very visible atmospheric product of combustion around the world, influences climate warming. In addition to its detrimental air quality and health effects, Bond et al., 2013 (cited 14 times), revealed that soot's ability to absorb sunlight ranks it the second most important climate warming agent after carbon dioxide, far greater than most previous estimates. Atmospheric aerosols act as seeds for cloud water droplets and ice particles. How aerosols affect clouds and the subsequent effect on climate is called the aerosol indirect effects. The science challenge is to understand how aerosols affect the scattering of sunlight by clouds. 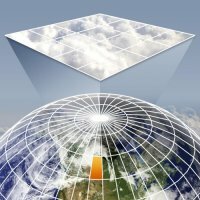 The PNNL study Wang et al., 2011, cited six times, designed a way to incorporate small-scale processes such as clouds into a global model, one of the toughest computational issues in global modeling. They developed a new aerosol-climate multi-scale model that embeds a cloud-resolving model within each grid column of a global climate model to depict aerosol-cloud interactions in a more realistic way than conventional global models. This computationally efficient technique enables multi-year simulations of small-scale processes. One PNNL-led study (Wang et al., 2012) cited five times in the report, narrows the large aerosol-cloud interaction uncertainties in future global warming projections with improved estimates of aerosol indirect effects. PNNL scientists developed a new metric for rain frequency susceptibility to aerosols using satellite observations that routinely collect coincidental global measurements. Their metric is closely correlated to aerosols' effects on clouds which they tested in three global climate models. In one of the climate models, they showed that previous estimates of aerosol effects on clouds are 30 percent too high. Tackling the aerosol-cloud complexity obstacle, Ghan et al., 2011, improved model representations of cloud droplet formation and compared global estimates of aerosol effects on Earth's climate using two of the new representations. The IPCC report cites this work as providing significant progress in representing droplet formation in global climate models. Bond T, SJ Doherty, DW Fahey, PM Forster, T Berntsen, O Boucher, B DeAngelo, MG Flanner, S Ghan, B Kärcher, D Koch, S Kinne, Y Kondo, PK Quinn, MC Sarofim, MG Schultz, M Schulz, C Venkataraman, H Zhang, S Zhang, N Bellouin, S Guttikunda, PK Hopke, MZ Jacobson, JW Kaiser, Z Klimont, U Lohmann, JP Schwarz, D Shindell, T Storelvmo, SG Warren, and C Zender. 2013. "Bounding the Role of Black Carbon Aerosol in the Climate System: A Scientific Assessment." Journal of Geophysical Research-Atmospheres 118(11):5380-5552. DOI: 10.1002/jgrd50171. Ghan SJ, X Liu, RC Easter, R Zaveri, PJ Rasch, JH Yoon, and B Eaton. 2012. "Toward a Minimal Representation of Aerosols in Climate Models: Comparative Decomposition of Aerosol Direct, Semi-Direct and Indirect Radiative Forcing." Journal of Climate 25:6461-6476. DOI: 10.1175/JCLI-D-11-00650.1. Ghan SJ, H Abdul-Razzak, A Nenes, Y Ming, X Liu, M Ovchinnikov, B Shipway, N Meskhidze, J Xu, and X Shi. 2011. "Droplet Nucleation: Physically-Based Parameterizations and Comparative Evaluation." Journal of Advances in Modeling of Earth Systems 3:M10001. DOI: 10.1029/2011MS000074. Liu X, RC Easter, SJ Ghan, R Zaveri, P Rasch, X Shi, JF Lamarque, A Gettelman, H Morrison, F Vitt, A Conley, S Park, R Neale, C Hannay, AM Ekman, P Hess, N Mahowald, W Collins, MJ Iacono, CS Bretherton, MG Flanner, and D Mitchell. 2012. "Toward a Minimal Representation of Aerosols in Climate Models: Description and Evaluation in the Community Atmosphere Model CAM5." Geoscientific Model Development 5(3):709-739. DOI: 10.5194/gmd-5-709-2012. Shrivastava M, JD Fast, RC Easter, WI Gustafson Jr, RA Zaveri, A Hodzic, and J Jimenez. 2011. "Modeling Organic Aerosols in a Megacity: Comparison of Simple and Complex Representations of the Volatility Basis Set Approach." Atmospheric Chemistry and Physics 11:6639-6662. DOI: 10.5194/acp-11-6639-2011. Wang M, SJ Ghan, X Liu, T L'Ecuyer, K Zhang, H Morrison, M Ovchinnikov, RC Easter, RT Marchand, D Chand, Y Qian, and JE Penner. 2012. "Constraining Cloud Lifetime Effects of Aerosols Using A-Train Satellite Observations." Geophysical Research Letters 39:L15709. DOI: 10.1029/2012GL052204. Wang M, S Ghan, M Ovchinnikov, X Liu, R Easter, E Kassianov, Y Qian, R Marchand and H Morrison. 2011. "Aerosol Indirect Effects in a Multi-Scale Aerosol-climate Model PNNL-MMF." Atmospheric Chemistry and Physics 11:5431-5455. DOI: 10.5194/acp-11-5431-2011.